St. Benedict's Parish in Chesapeake, Virginia, is home of the Extraordinary Form of the Roman Rite (Latin) Mass in Hampton Roads, offering Daily Confession, Daily Mass and sacraments according to the Liturgical Books of 1962. Established under the auspices of the Diocese of Richmond, St. Benedict's Parish is staffed by the Priestly Fraternity of St. Peter (FSSP). St. Anne’s Sodality - Meets on 1st Tuesday at 6PM. All ladies 18 years and older are welcome. All Masses and Sacraments are offered in the Extraordinary Form of the Roman Rite. A great crowd was walking down the boardwalk of the beach, the line of people creating a mighty river that stretched far down the shore. At their head an icon of St. Michael was carried aloft, followed by the main banner and the processional crucifix. Then came a stately row of flags representing the United States, the Vatican, POWs/MIAs and the State of Virginia. The men in colorful capes who bore the flags also carried their own flag, which, of course, was that of the Knights of Columbus. Beyond them came the clerics in attendance, and then four scarlet-caped Knights carrying a gold-fringed canopy. 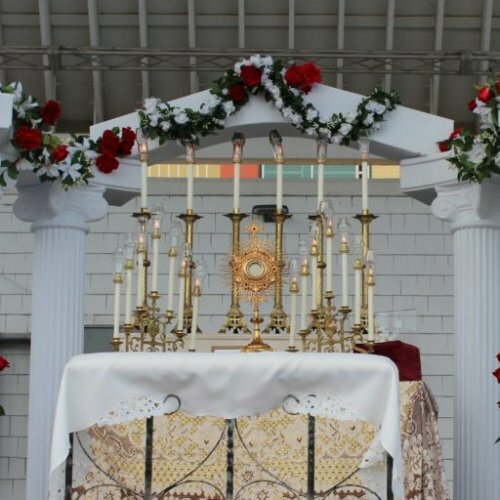 Under the canopy was Our Eucharistic Lord, enthroned in a magnificent monstrance held by the hands of a priest in a white cope with IHS emblazoned on the back. And then followed another row of Knights, and with them the vast crowd of faithful who had come to walk with Our Lord in the annual Eucharistic Procession on the Virginia Beach Boardwalk. The event, which is a coordinated effort of several parishes, began at Star of the Sea Catholic Church, where the faithful first gathered and Our Lord was enthroned in the monstrance before the procession exited the church, crossed over Pacific and Atlantic Avenues and turned north onto the broad boardwalk that parallels the beach. One can only imagine how the waves of the neighboring sea sang along with the hymns the people sang, and how the incense offered to Our Eucharistic Lord mingled with the salty maritime air. He Who made the mighty oceans was receiving the praises of His own creation, and He passed by under the appearance of that most humble creation, a little piece of bread. The procession then entered a park where an altar of repose had been arranged. Our Lord was placed upon the altar, and there was a period of silent adoration and a short sermon on the Eucharist followed by Benediction. Then all returned to Star of the Sea, following the same route they had come. This is the sixth year for the procession, although there have only been five that have taken place, last year’s being cancelled due to Hurricane Matthew. The inaugural event took place on October 13, 2012, the 95th anniversary of the Miracle of the Sun, and this year’s was held near the 100th anniversary. The procession is the fruit of an idea planted nearly forty years ago when founder Michael Cistola was still a student at Star of the Sea school. The school was staffed by IHM sisters, and one of them expressed her dream of a procession on the Virginia Beach Boardwalk honoring Our Eucharistic Lord. The sister’s idea stayed with Mr. Cistola, and the time came for its materialization in 2012. In response to the HHS mandate which was being put forward at the time, His Excellency the Most Reverend Francis DiLorenzo, the late Bishop of Richmond, published bulletin inserts discussing the U.S. Bishops’ united opposition to the mandate and the Bishops’ call to all Catholics to urgent action and prayer against the unjust law. Mr. Cistola, a parishioner at St. Benedict’s, the FSSP’s parish in Chesapeake, saw the procession as a response to this call, and subsequently asked and obtained the Bishop’s permission to hold the procession. Fr. Neal Nichols, pastor of St. Benedict’s, coordinated the liturgical aspects of the procession and has done so every year since, meeting at Star of the Sea with the planning committee several times a year and involving as many clergy as possible. St. Benedict’s always has a grand representation at the procession and among the volunteers who organize the event. If you are in the Virginia Beach area in October, do consider joining the Eucharistic Procession on the Virginia Beach Boardwalk. An idea sown in the mind of a child by a devoted IHM sister so many years ago has blossomed into a thing of celestial beauty, that, Deo volente, will grace the shores of Virginia Beach for years and years to come.